In his book, Catholicism — A Journey to the Heart of Faith, Fr. Robert Barron has mined deeply in the treasure of Catholic thought. He articulates the Catholic approach and perspective to Christianity extremely well, explaining the multitude of ways…art and architecture, liturgical practices, sacraments and saints, great theologians, and so on that can lead us to an understanding of God. No book on Catholicism would be complete without a discussion of two uniquely Catholic concepts: The Mass and Mary. Each of them is given a full chapter. He follows the steps, symbolism and meaning of the Mass in great detail and addresses what he calls fallen mankind’s solitary boast, Mary, the Mother of God. There are two recurring themes in the book, both of which I found insightful. The first of these is the noncompetitive nature of God. On the surface, simple logic leads one to realize that God has no reason to be jealous of the feeble little creatures He created. However, the idea is seldom articulated as well as Father Barron has done. The second idea is equally subtle. So much so, in fact, that it has been reduced to the trite expression, “God is love.” We so often say it, but never plumb the depth of its meaning and implications. I also enjoyed his discussion of the Communion of Saints and the individuals he chose to illustrate God’s grace working in human lives. In the first chapter Barron says he hasn’t written “a plodding theological study” and the rest of the book delivers on that promise. Though Catholicism draws from the great reservoir of Catholic theological writings, it never becomes dry and inaccessible. I highly recommend this interesting and educational book to Catholics and non-Catholics alike. For more information or to obtain a copy, visit Random House's Wbsite. I read this book and was thoroughly engaged. I learned so much about my adopted faith thanks to Fr. 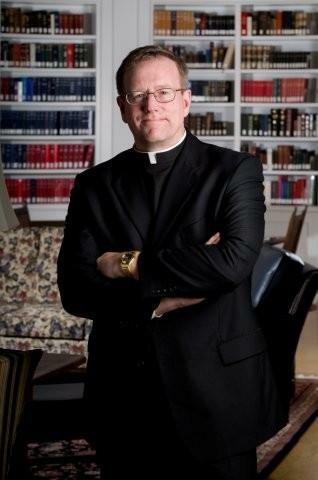 Robert Barron. Be sure to watch the video provided through First Wild Card. It gives a sense of what treasures are to be found in the book, Catholicism. Highly recommend it to everyone.